Home Page | blog | Is Robotic Spine Surgery Safe? Is Robotic Spine Surgery Safe? 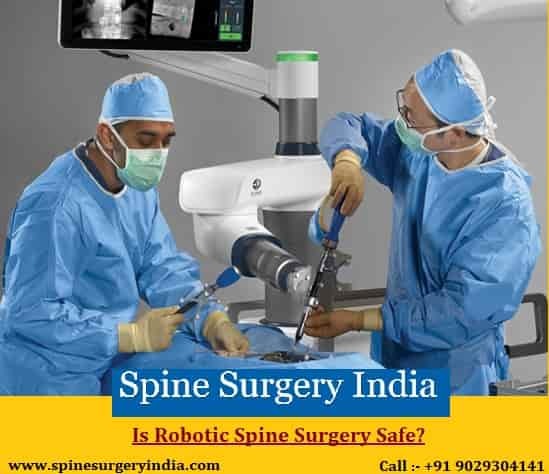 Robotic spine surgery in india is one of the safest and most accurate minimally invasive spinal procedures available at the hospitals under Spine Surgery India. According to the study, the surgeons have used the robotic guidance in over 30,000 procedures also they placed more than 80,000 implants. This procedure allows the surgeons to place implants with over 98% accuracy, also it reduces patient exposure to radiation and virtually eliminates the error of the human hand. Robotic spine surgery is a minimally invasive surgical technique which help surgeons to access patients affected area of the spine using a smaller opening whereas, in traditional, open spine surgery, the surgeons will make a large five to six inch incisions down the back, cutting through muscle and other soft tissue so that they can access the affected portions of your spine. This is the reason that minimally invasive surgery is becoming the standard for care in most instances of spine surgery, as the access at the affected area of the spine through smaller opening means that there is less blood loss and tissue damage as well there is a reduced risk of infection following the surgery. According to the study, it has been found that accessing the spine through a smaller opening will decrease the amount that a surgeon can see; however, it will increase the chance that implants won’t be placed as accurately as they have placed in an open format. This is where the robotic procedure is the best option to treat the affected spine. Why people prefer robotic surgery over open surgery? There are times when machine does not do any of the operating involved in the surgery, but with the help of computer technology it moves to the exact location where the surgeons at the hospitals under Spine Surgery India need to place screws, rods, etc. and this will allow your surgeon to insert the device more quickly and accurately. Robotic spine surgery is the combination of the best worlds from minimally invasive surgery and open surgery as this allows your surgeon to see exactly what they are doing and placing the devices precisely where they need to while accessing the spine through a smaller opening. It has been found that people who opted for robotic surgery experience 5 times less surgical complications during surgery and also there is a reduction in revision surgeries as compared to traditional, freehand minimally invasive spine surgery. How the procedure of robotic spine surgery works? The surgeons at the hospitals under Spine Surgery India will make sure that implant will be placed accurately in the first time only and for this, your surgeon will take a full three dimensional preoperative scan of your spine. This preoperative scan will allow your surgeon to plan exactly how and where they are going to access your spine. They will mark the position where the implant or devices need to be placed and they store the program into a computer before you enter the operating room. Before performing the actual robotic spine surgery in India when you are under general anesthesia your surgeon will take a 3D synchronization of your spine to make sure that the intraoperative images are matching to their corresponding location on the preoperative scan. Once they have done with the procedure, the robotic software provides precise instruction to your spine surgeon that where they need to place the guidance unit and move towards the pre-planned location. This procedure will allow the spine surgeons at the hospitals under Spine Surgery India to place the implant accurately and quickly based on the pre-plan trajectory. As your surgeon has already taken 3D imaging of your spine so, there is no need to take intraoperative x-rays during surgery which reduces radiation exposure to you and operating room staff. The surgeons who have performed more than hundreds of spine procedures using robotic procedure are the surgeons who are highly skilled and trained professionals who have successfully achieved the best results of the treatment using the robotic procedure. This is one of the safest procedures which allow the surgeons at the hospitals under Spine Surgery India to be more accurate as compared to the surgery which is performed by using a hand. With the help of robotic spine surgery, there are fewer chances of complications and people recover quickly and fast even from the most dramatic spine surgery. How Robotics is Changing Spine Surgery? Robotics is the procedure through which your spine surgeon will be able to access a level precision which is impossible to achieve with the human hand. Even the best surgeon cannot be accurate 100% all of the time but with the help of robotics, it will not happen. According to the study, the surgeons at the hospitals under Spine Surgery India are able to perform around 95% accurate surgeries using robotics and around 99% accurate surgeries using Mazor Robotic Guidance. Mazor Robotics is a procedure that has raised the standard for what accuracy needs to look like in spine surgery and now most of the neurosurgeons are adopting this procedure to treat the affected area of the spine. Robotic guidance also provides safety to patients and to the people in the operating room during the surgery. Robotic is a procedure which also reduces the need for intraoperative x-rays and also protects the patients and other staff members in the operating room from radiation exposure. In this procedure, your surgeon will not expose large areas of your back and cut through muscles in order to access your spine instead of doing this they use the power of robotic guidance and a 3D synchronization of your spine and will able to view everything that they need to from the screen, which means that they work through small openings and treat the affected area of spine. This procedure of robotic will helps surgeries go faster and more efficiently, also they are significantly less invasive and allow the surgeons to spare everyone in the operating room from unnecessary radiation which affects the health of the other people.